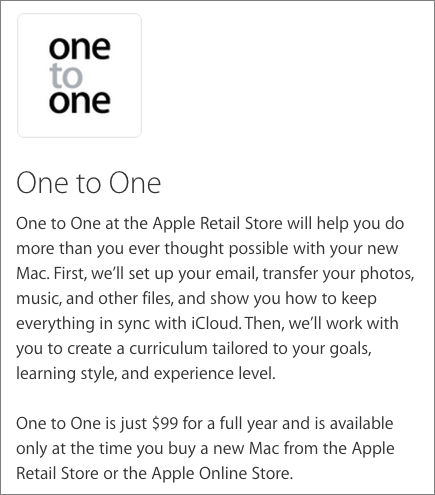 We’ve heard from several sources that Apple plans to drop its One to One training program by the end of September 2015. Priced at $99 per year and available only when buying a Mac from Apple, the One to One program entitles customers to a variety of personalized services at an Apple retail store, including data migration within the first 60 days of membership, up to an hour-long one-on-one session with a trainer on the topic of your choice, group training sessions on specific topics, and open training sessions on individual projects. If that sounds like a lot of personal interaction for $99 per year, you’re right, and that’s undoubtedly why Apple is eliminating the program. The Apple retail stores will continue to give free hour-long workshops on a variety of topics. It’s unclear if some sort of data migration service will remain available. The practical upshot is that if you’re planning to buy a new Mac this month anyway, you can still sign up for One to One training, since Apple will reportedly be honoring the program through the end of September 2016. Barring that, or if you need more significant help than you’re likely to get in an Apple Store, you’ll often find equally knowledgeable people at independent Apple Specialists and among the membership of the Apple Consultants Network. And, of course, you could always seek out your local Mac user group, most of which provide lots of support for free. What about migrating data from an "old" Apple computer to a new one? That was a big plus to the One to One program. Any word as to whether they'll cut that out as well? If so, it's going to be much more difficult to replace an existing Mac. Maybe they're planning to charge for that service? No word on that yet - hopefully they'll have a story there once the announcement is official. This is what I have recommended to some of my older friends who have wanted a new Mac, or to change from PC to Mac. This sometimes was what the decision to buy a Mac was based on, this wonderful help. Told them about the one on one and the help transferring their pictures and data, and they are thrilled. Older folks need this kind of help! And our local store was very very good at this. When this goes away, it will discourage some people. For both you and Martha, Jane, I strongly encourage you to look for a local user group, or one of the other resources I mention in the final paragraph. Historically, the best support has always come from outside Apple.